It has been a year or so since Ford discontinued the production of its Focus RS hot hatch line, but the model continues to be useful in some ways. A while ago, Ford Performance placed an order with its factory to improve the standard Focus RS engine to match the higher Mustang standards. Before the upgrade, the base trim of the Ford Mustang came with an EcoBoost 2.3 four-banger that produced 314 hp (234 kW) along with 475 Nm (350 lbft) of torque. Once fitted with a larger turbocharger and better software, it rose to 335 hp (250 kW). The maximum torque remained unchanged, but it is now available between 2,500 and 5,300 RPM, which is also rather impressive. Finally, the factory has made the new engine compatible with a nine-speed automatic transmission. You will have to opt for the 2.3L High Performance package when buying your coupe or convertible to take advantage of the new powertrain. Also included in the offer are four-piston front brakes, front suspension strut, a quad-pipe exhaust system, stronger roll stabilizers, a limited-slip differential, and numerous tweaks to the steering, ESP, and ABS systems. In terms of pure eye candy, all EcoBoost 2.3 models sport a new radiator grille, grey stripes running down the hood, side mirrors with the same ornament, a rear spoiler, and special badges. A number of steering aids are separately available for the convertible, including a solid rear roll bar, adaptive shocks, 19-inch wheels, and the Torsen self-locking differential. 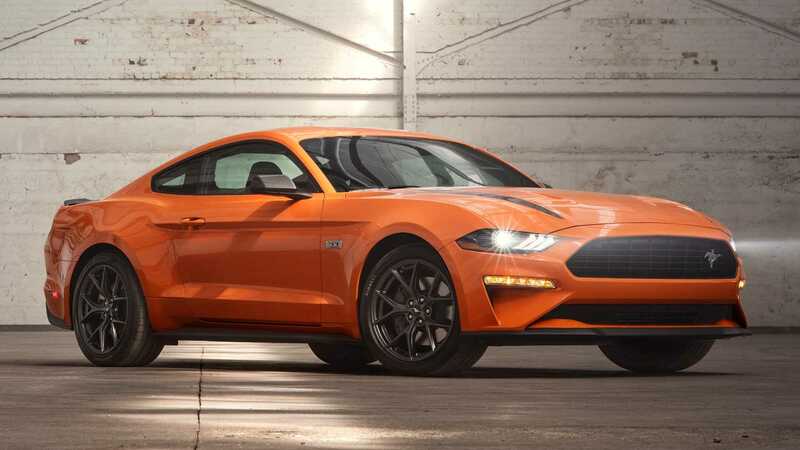 Prices for the 2020 Ford Mustang series equipped with Focus RS engines will become available later. Sales should also start soon.